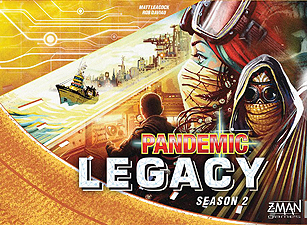 Pandemic Legacy: Season 2 is an epic cooperative game for 2 to 4 players. Unlike most other games, this one is working against you. What's more, some of the actions you take in Pandemic Legacy will carry you over to future games. No two worlds will ever be alike! For three generations, we, the last fragment of humanity, have lived on the seas, on floating stations called "havens." Far from the plague, we are able to provide supplies to the mainland to keep them (and us) from succumbing completely.